Here is a cool video that shows what it was like to be in the nose of the restored B-29 "Doc" when it made its first flight after being restored yesterday. 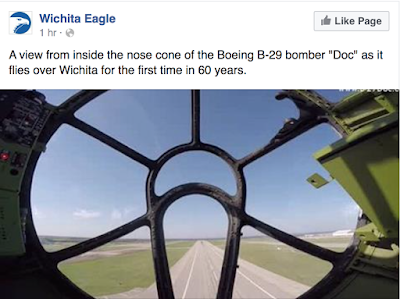 Doc was built at Boeing Wichita during WWII, so it is especially appropriate it was restored and flew first the first time yesterday. An amazing return to the air! Not a better place for this to happen since Wichita is the AIR CAPITAL!